Artworks displayed in the slides above were designed with ImagePaint Production Pro. Real wood veneers were cut with an Epilog Laser Mini 18 using ImagePaint's Automatic Production CNC Interface. Some images shown above represents the actual physical artworks, while others represent the finished designs still in digital format. With ImagePaint, you don't have to be an artist to take your design to a new dimension. ImagePaint is an Adobe Illustrator plug-in. ImagePaint introduces a unique concept "What You See Is What You Get" into the art of, but not limited to, material inlay/marquetry design and production. It is a 2D material-based graphic design software that allows users to take full advantage of the textures, colors and tonal variations of the physical materials, thus adding 3D visual effects to a 2D artwork. 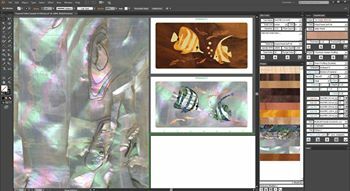 Inside Adobe Illustrator, these physical materials are JPEG images of actual raw materials such as wood, stones, fabric, seashells and other decorative materials. With ImagePaint, you can create artworks made of wood veneers, fabric, seashells and other decorative materials. You can inlay these artworks into furniture, cabinets, floors, jewelry, trophies, wooden boxes, guitars and other high end, custom made products. It may not be clear what other products you can create with ImagePaint until you have learned what it can do and how it can help you expand your creativity through its advanced product visualization features and its image-based design technology. With ImagePaint, users with little experience in using Adobe Illustrator and CNC technologies such as laser and CNC router, can quickly create toolpaths ready to be sent to the CNC for cutting. After the material is cut, ImagePaint updates and creates new images to facilitate material reuse. So, Adobe Illustrator gives you the best-in-class tools to create the vector design and ImagePaint gives you the only tool available to visualize and turn that vector design into a product. 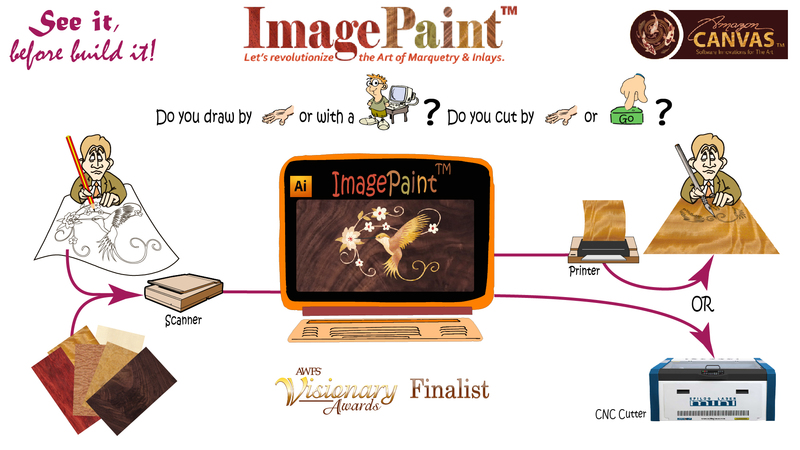 ImagePaint software is developed by engineers and artists for artists, craftsmen, furniture makers, cabinet makers, sign makers, trophy makers, interior designers, architects, students and woodworking enthusiasts. Creative users require creative tools, so ImagePaint had placed high emphasis on product visualization, software automation and ease of use. It was designed to take away the mundane computer design tasks, the requirements of the users understanding the technical CNC jargon and the expertise in setting up a CAD software to properly control a CNC. So, if you just want to spend the time to create art and let the software handles the rest of the other boring, but necessary technical tasks, then ImagePaint is the right software for you. On the other hand, if you enjoy working at the technical level, then Image Paint can inspire you too, with its fully user-configurable interface. 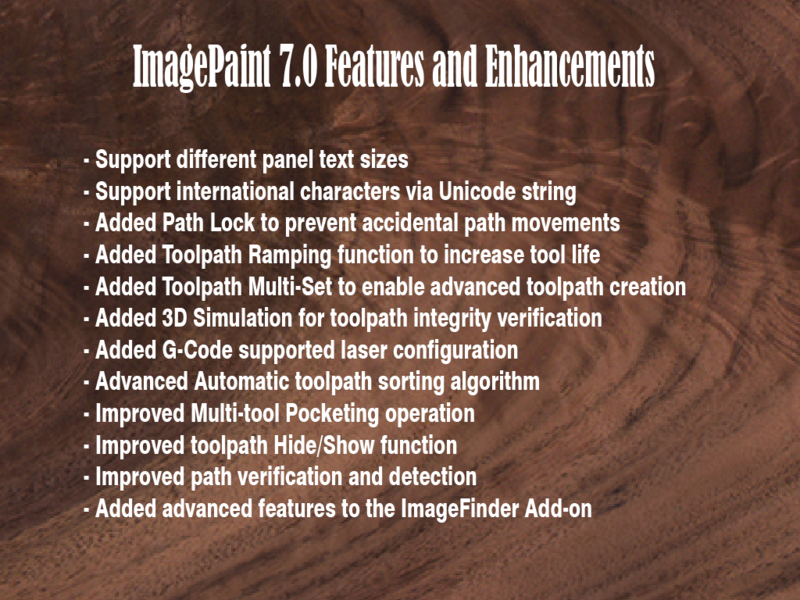 All ImagePaint editions below, including the NEW ImageFinder add-on, are contained in the same download package. Once installed, all features are enabled and fully functional, even if it is not activated with a purchase license key. But without a purchased license key, ImagePaint will only work with artworks included in the download or artworks with 4 anchor points or less. Are you a CorelDraw, Sketch or other Graphic Design Software users? If you are not familiar with using Adobe Illustrator, no need to worry, Adobe Illustrator can open your vector design file created in your favorite Graphic Design Software. Once that is done, you can start using ImagePaint immediately without having to learn much about Adobe Illustrator. ImagePaint provides its own user-friendly User Interface with functions that are fully automated. Our mission is to help keep the Art of Marquetry and Inlays alive. We believe strongly that our students will be the one who will take this rare art style to the next level and be recognized as fine art. If you are a student or an educator, please give us a call to get this special pricing. Where to lease Adobe Illustrator CC? If you are not satisfied with ImagePaint during the guarantee period, we will be happy to issue a full refund. Please subscribe to get latest news, updates and other important announcements from Amazon Canvas. Your privacy is very important to us. We are committed to earning your trust by safeguarding your personal information. All the information you provide to us is securely maintained and is kept strictly confidential. We do not, and will not, sell or rent our customer lists or private information to other companies or individuals. Also, please join our User Group on Facebook. This group was created for laser users, CNC users and ImagePaint users to share ideas, post questions, report bugs, request new features and anything related to CNC and the art of Marquetry and Inlay. This download contains all features to support both Laser and CNC Router. If a valid license key is applied, it will become a fully featured software, otherwise it will stay a trial version indefinitely and only work with sample designs included in the download. IMPORTANT: Your purchased product key prior to version 7 will not work with this version. You need to upgrade to version 7 to obtain a new product key. This Facebook group was created for CNC Router and Laser users, who are using or are interested in ImagePaint, to share ideas, post questions, report bugs, request new features and anything related to ImagePaint and the art of Marquetry and Inlay. 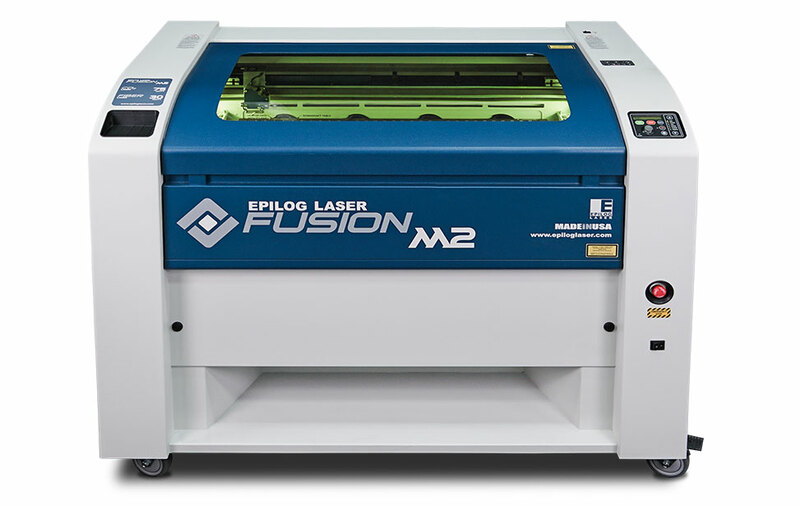 Epilog Laser systems are known worldwide for their reliability and performance, which translates into less down time and more profits for you. 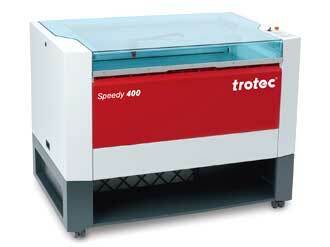 Trotec offers laser engraving and cutting machines for treating different materials. Cut, engrave and mark wood, paper, metal, acrylic, leather, stone, plastics and many more.